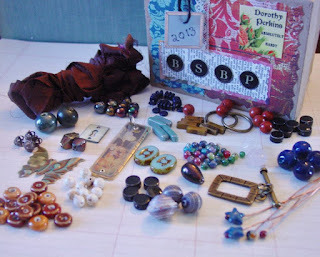 I really consider myself blessed in my two partner for the Bead Soup Blog Party. I just had to share all the incredible goodies that I got from Laura of Blue Antiquities. I have to admit that Laura amazes me in that she is busy with three kids but still found the time to make the beautiful floral focal. I can hardly wait to get starting on this soup. Now remember that according to the rules I have to use the pendant and the clasp though I can't see myself not using a lot more of my soup and coming up with a few different designs.